After receiving a complaint from MySpace regarding 56,000 user names and passwords behind archived in the mailing lists of Seclists.org, a computer protection site, Go Daddy shut down over 250,000 pages of security information. 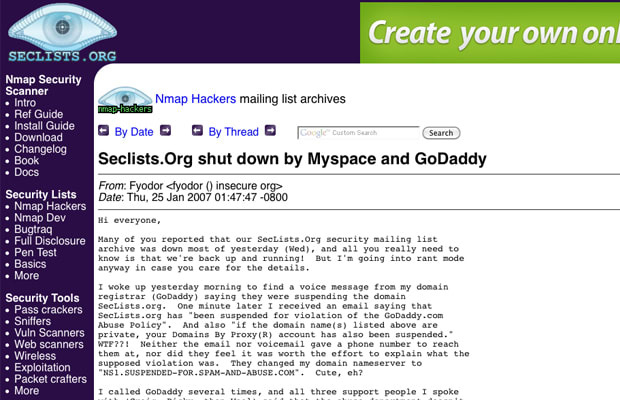 According to logs sent over to CNET by Seclists.org administrator Gordon Lyon, Go Daddy deactivated the site 52 seconds after leaving him a voicemail, encouraging Lyon to create NoDaddy.com: a consumer activist site where unhappy customers and GoDaddy whistleblowers could share their horror stories. Four years later, the domain giant acquired No Daddy in hopes of silencing the backlash. Too late.